Before you start thinking I’m crazy – “This chick tried to pass off tofu as eggs last week, and now this? !” – allow me to explain myself and this recipe. 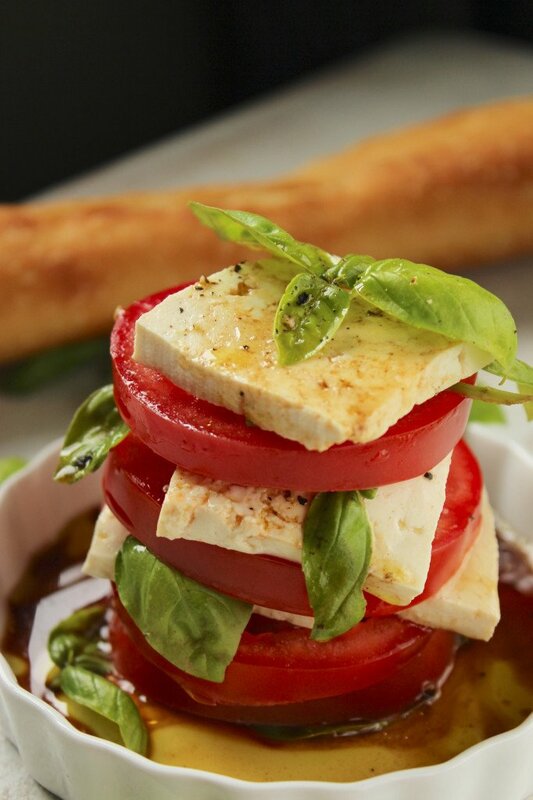 Caprese salad is one of my favorite dishes. It’s supposed to be an appetizer, but I would happily eat caprese and only caprese for my dinner. It’s such a genius combination of ingredients – juicy tomatoes, fresh and fragrant basil, salty mozzarella, and there should always be a drizzle of good olive oil for good measure. For the lactose intolerant or vegans among us, though, there’s another way to enjoy this classic appetizer. I’d never heard of caprese, let alone tried it until we lived in New York in the summer of 2011. On our first night in the city, we ended up at the famous and notorious Cipriani’s Downtown for dinner. One of the appetizers was – you guessed it – caprese salad. Before tasting it, I had to secretly ask one of the other dinner attendees what, exactly, it was. Keep in mind, this was in my skeptical, anti-awesome-food days. But I tried it so it wouldn’t seem like I belonged at the kid’s table. I look back at this as one of the defining moments of my journey with food. At the time, I wasn’t at all interested in chunks of cold cheese mixed with tomatoes and leaves. Pass me a slice of pizza or a grilled cheese, please. Trying not to turn up my nose in premature disgust, I went in for my first bite. And in that moment, I totally understood. These flavors were meant to go together. Each bite combines silky, crunchy, and juicy with aromatic sweet and salty flavors. 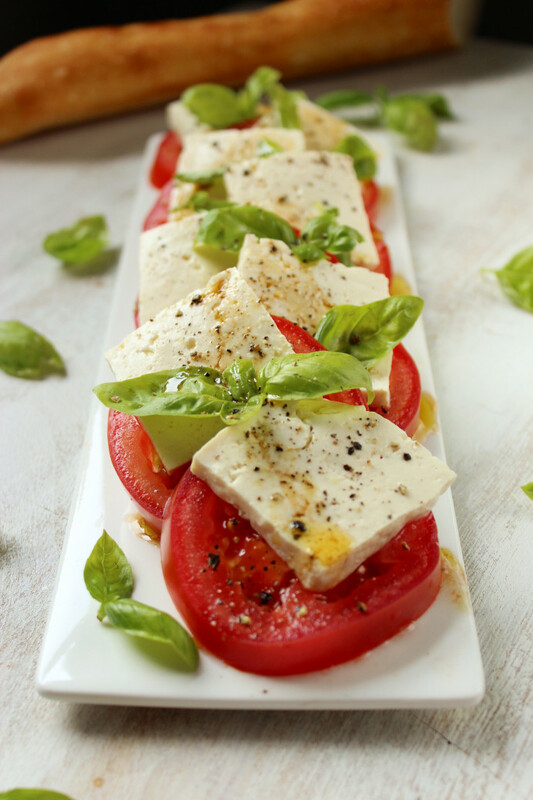 When it’s done right, with quality ingredients, caprese salad makes you feel like you’ve sat down to dinner with an Italian family who has picked the tomatoes from their garden, brought the basil from a neighbor, and picked up the cheese from their favorite farmer that morning. The dish is freshness and simplicity defined. Nowadays, I steer clear of dairy as much as possible. While I’ve never been diagnosed as lactose intolerant, I’ve realized that my body doesn’t like the way dairy affects it. 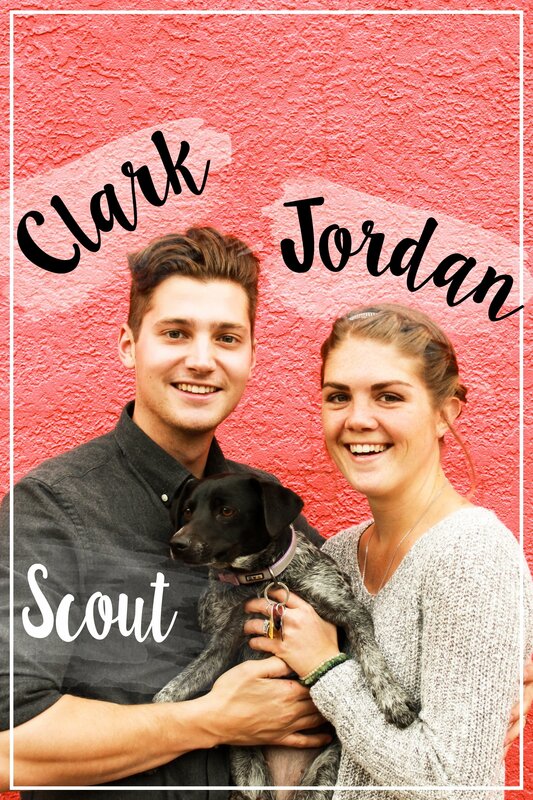 Clark thought of this alternative while we were somewhere between the Badlands and Devil’s Tower, and at first I was thinking “No. Way.” But then I thought about it for a minute… tofu has a similar texture to mozzarella and it can be seasoned in a million different ways. Worth a shot, right? You’ll have to take my word for it when I say you can hardly tell the difference between the tofu and mozzarella. Put any skepticism aside and try this for yourself. I won’t be making this every day, or even every week, because this kind of dish is a special treat for me. But it’s nice to know that I have a way to make “caprese” at home, without all of that dairy messing with my system. Some people like to add a drizzle balsamic vinegar for good measure, and I think that’s a good touch, too. As for me, I like to grind some fresh black pepper and sea salt over top of everything. When tomatoes and basil are as fresh and abundant as they are right now, I think simplicity is the way to go. 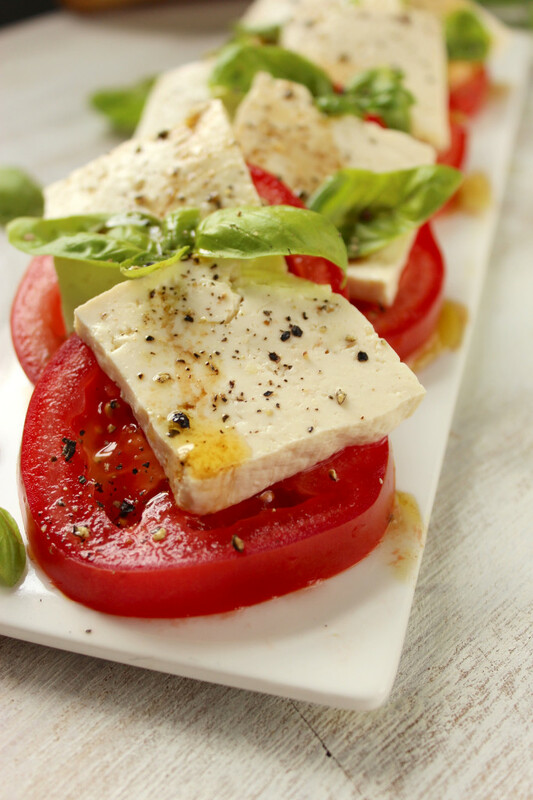 Tofu makes this classic, flavorful appetizer vegan and lactose-free. Try it for a special occasion or just because! To prep and cure tofu, drain liquid from the container and use paper towel or a towel to remove excess water. I highly recommend using organic, non-GMO tofu. Given that it is a soy product, non-organic brands of tofu are very likely to be GMO. Slice tofu into 1/3″ thick pieces, about 2″ by 3″ in size. Line a baking sheet with aluminum foil or saran wrap and place a cooling rack on top of the baking sheet. Arrange tofu slices on baking sheet and squeeze lemon juice over the pieces, then flip and repeat on other side. Sprinkle tofu slices with 2 teaspoons of sea salt. Refrigerate, uncovered for 12 hours. When you’re ready to assemble, slice tomatoes into 1/3″ rounds and set aside. 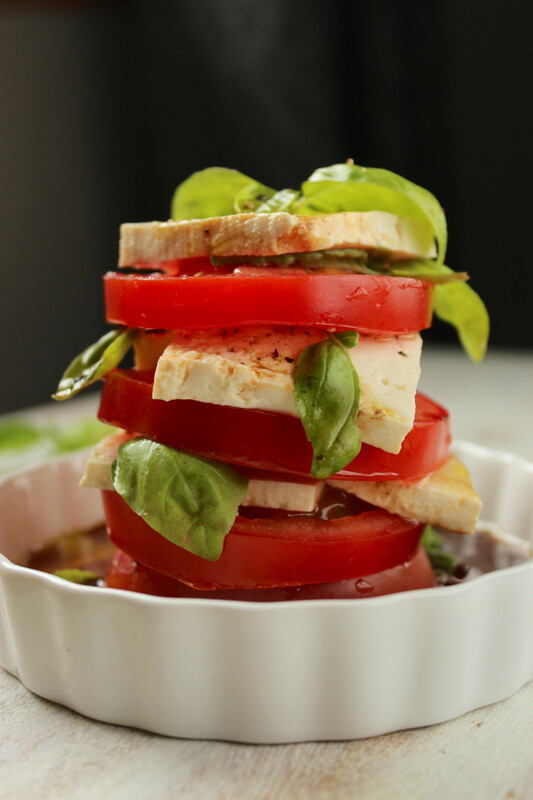 Layer tofu and tomato slices in alternating order on a plate. They can be laid flat or stacked, whichever you prefer. 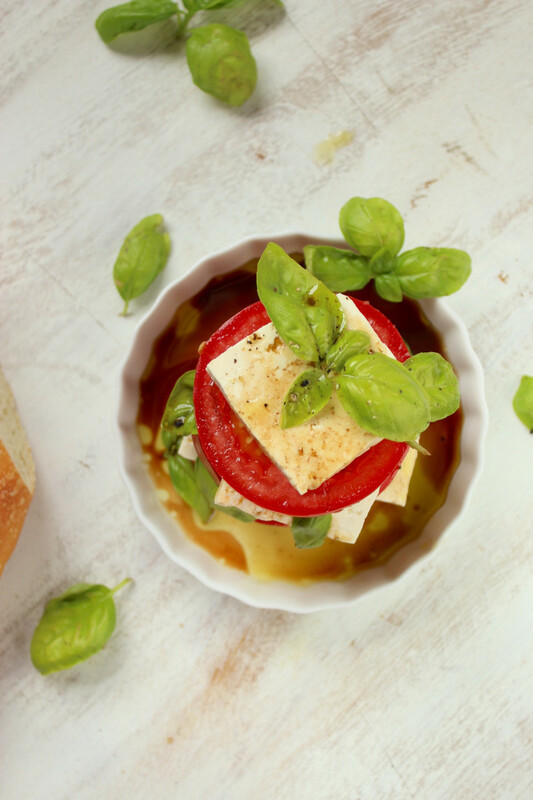 Toss a generous helping of basil over the tofu and tomatoes, then drizzle as much olive oil as you like. Finish it off with a few pinches of salt and pepper and serve! I really miss this dish, thanks for this recipe! 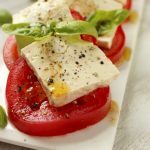 i love caprese salad.. love this vegan alternative. thanks for sharing!